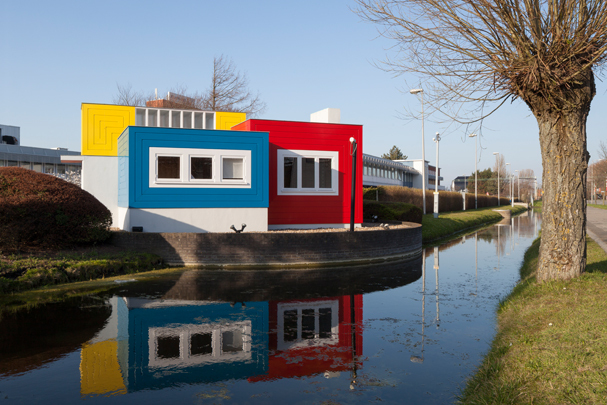 The temporary site office erected during the construction of the equally temporary Oud-Mathenesse housing estate is, together with Café De Unie, the only built evidence of Oud's De Stijl membership. The shed consists of three interlocking volumes, each with its own colour. Oud made use both inside and out of the decorative properties of wood. For a time it served as a neighbourhood shop but during the war the dilapidated little building ended up as firewood. After Oud's White Village was pulled down in 1989 and rebuilt to Paul de Ley's plan, a replica of the works office building was built alongside it. A prototype of the replica of the shed made in 1992 stands in the grounds of AKZO Coatings in Sassenheim. Built to mark 200 years of the Sikkens paint company, it is used by the Sikkens Foundation.